I am always on the hunt for desirable fish, especially those which seldom make their way into home reef aquariums. Although it is great to see a healthy Yellow surgeonfish or Copperband butterfly, these fish do not elicit an "oh!" or "ah" response from me. Simply put, they are so common, they nearly bore me. I suppose to the average houseguest the Yellow surgeon is quite a sight to behold; to the average aquarist, however, it is nothing more than the saltwater equivalent of a freshwater or brackish cichlid or discus. If the aquarium store maintains an inventory of saltwater fish, chances are that one, if not several, is a Yellow surgeon. Instead of something so common, I like to search for the uncommon. 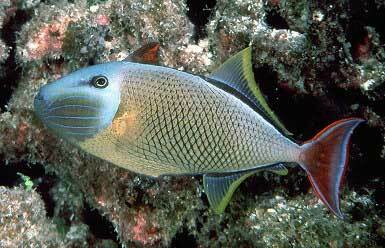 One place I find it is in triggerfish of the genus Xanthichthys. Although not small, they are similar in size to many of the smaller surgeonfish. 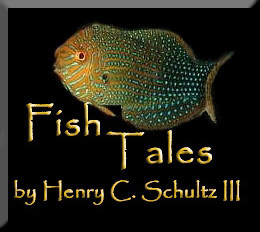 Additionally, the triggerfishes' personality is often outgoing and sometimes as curious and mischievous as a kitten's, thereby making them more interesting, and perhaps more suitable, aquarium inhabitants than the freak-easy surgeonfish. in typical reef aquariums. Photos courtesy of Greg Rothschild. Triggerfishes are members of the family Balistidae, sometimes considered one of the more evolutionarily advanced families of marine fish. A dozen genera comprise the family, which totals less than 40 species. Certain characteristics are shared by all members of the family, notably two dorsal fins but no pelvic fins, eight teeth on the front jaw followed immediately by an additional six teeth and a large, well-developed pharyngeal plate which is well-suited for crushing various hard-shelled crustaceans (Michael, 1998). The genus Xanthichthys contains exactly five species. I can affirm this with certainty because this is perhaps one of the least confusing marine fish genera for ichthyologists. The greatest cause of confusion came from X. auromarginatus and X. mento and their various color forms. Xanthichthys was first described by Kaup (in Richardson, 1856). Three species were credited to the genus by Berry and Baldwin (1966); a forth was added by Klausewitz (1974), and finally the last member was recognized 27 years ago (Randall et al, 1978). Among the many listed characteristics of the genus was one in particular: "Mouth very small" (Randall et al, 1978). Four species are represented in Indo-Pacific waters, yet Xanthichthys ringens is known only from the Atlantic Ocean. Specimens have been collected from as far north as South Carolina and extending as far south as Brazil. St. Lucia, Florida and Cuba all have healthy populations. Perhaps the largest geographical distribution of the genus occurs in X. caeruleolineatus, which is present from the Tuamotu Archipelago to the St. Brandon's Shoals. Another distribution point worth mentioning is the anti-tropical distribution of X. mento and how both pre-juveniles of X. mento and X. ringens have been found up to 500 miles off the coast. Like its Indo-Pacific brethren, X. ringens prefers deeper waters near steep dropoffs and is "rarely encountered at depths of less than 100 feet" (Randall, 1968). At least one submarine observation has noted X. ringens patrolling about 400 feet deep off the Jamaican coast. No specimens of X. caeruleolineatus have been collected using traditional SCUBA equipment, probably because most individuals have been found at depths of 600 feet or more. A slightly upturned mouth, which remains very small throughout the fish's lifespan, does not allow Xanthichthys to consume the same foods as many other triggerfishes. Instead, species of the genus Xanthichthys concentrate their diet on free-floating zooplankton, which they eagerly pluck from the water column. In fact, stomach contents of X. auromarginatus revealed the fish fed exclusively on zooplankton (Hobson, 1974). Additional notes from this study indicated the vast majority of the zooplankton were calanoid copepods. Two species are known to display distinct sexual dichromatism between the adult males and females. This led to some confusion about species classification, but that was nevertheless worked out more easily than in most other dichromatic genera. Xanthichthys auromarginatus and X. mento each have beautiful male colorations while the females are certainly less attractive and flashy. Xanthichthys auromarginatus is another species of the genus which is found in American waters. It is a common reef fish around Hawaii in depths ranging from 40 - 90 feet. Males (left) are available in the trade, but the dull colored females (right) are not collected often, so pairs may be difficult to obtain. Photos courtesy of John Randall. Like so many other members of the family Balistidae, individuals of Xanthichthys species can adapt well into the confined conditions of the home aquarium. They remain fairly hardy fish and are quite disease resistant. Unlike many other triggerfish, however, it is not common for Xanthichthys to harass other fish. If a juvenile Xanthichthys is added as the last fish into the aquarium, chances are in the hobbyist's favor that the triggerfish, with few exceptions, will remain a peaceful resident for the duration of its captive life. Assessors will remain hidden the majority of the time. Slower batfish may feel intimidated by fast-moving triggerfish. Cardinals will likely stay closer to rockwork for added protection. 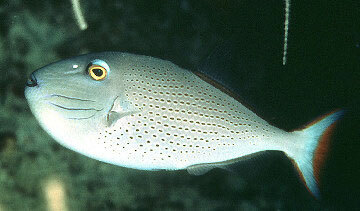 Slower cowfish may feel threatened by the speed of the triggerfish. Assuming the frogfish is not capable of consuming the triggerfish, they should co-exist well. Smaller zooplankton-feeding gobies will feel threatened by the size and speed of the triggerfish. Add the jawfish first and allow several months for it to fully settle into the aquarium. Pipefish are best suited for a species-dedicated aquarium. Seahorses are best suited for a species-dedicated aquarium. Will likely try to consume the triggerfish. Note: While many of the fish listed are good tankmates for Xanthichthys species, you should research each fish individually before adding it to your aquarium. Some of the mentioned fish are better left in the ocean or for advanced aquarists. Situations that require caution are those that involve mixing Xanthichthys with small, shy or passively feeding fish. Although the triggerfish will not likely physically attack them, the smaller fish may feel threatened and thus hide constantly and/or fail to feed. This is certainly not an ideal situation and is best avoided with a little forethought about the adult size of all fish concerned. Some of the more ideal fish to house with these triggers would be surgeonfish, butterflyfish or angelfish. Mixing two Xanthichthys species can make for an attractive display, but it should be attempted by using only male/female pairs. trade due to the great depths at which they are located. Xanthichthys will also ignore a good number of invertebrates. Starfish, snails, cucumbers and even cleaner shrimp should be left alone. Small decorative shrimp, however, should be avoided - they may be too tempting for the trigger to resist. Finally, corals have little to fear, as they will seldom be subjected to harassment. Another positive characteristic of these triggerfish is their less than picky demeanor during meal time. As planktonic feeders, just about anything that drifts helplessly in the aquarium's currents will be sampled. A diet rich in Mysid shrimp species will undoubtedly provide the nutritional needs of the triggerfish, but variety is also key to their overall well-being. Some additional foods to include, therefore, would be cut clam, shrimp and squid meat, plus flake and pellet foods made with the marine carnivore in mind. A little roughage in the diet is always a good thing, so mixing in the occasional dried seaweed would also be beneficial. Aquarium size is always an important consideration when dealing with fish that can reach 8 or 10" in length. Toss in the triggerfish's long-range swimming capabilities and this concern is magnified. Ideally speaking, I would prefer to see each of these fish added to an 8 or 10' long aquarium. However, the stark reality is that the vast majority of reefkeepers do not own aquariums of this magnitude, yet this will not deter them from keeping fish that are not ideally suited to their aquarium's size. With this in mind I will recommend a 4' long aquarium as the absolute minimum size. Additionally, in such a confined aquarium the triggerfish should be the largest fish and other open water swimming fish, such as surgeonfish, should be avoided. Regardless of what size aquarium you choose, be sure the tank is aquascaped in a manner which will maximize the available swimming area. Although it's not always the most attractive aquascaping option, a reef wall will mimic their natural habitat and afford the fish ample room along the front to swim. A few other peculiarities of triggerfishes should be mentioned. 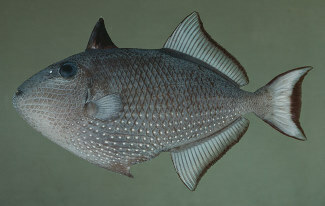 Although not as commonly as the larger and more aggressive triggerfish, such as the genus Rhinecanthus, Xanthichthys species occasionally will pick up rubble rock or even coral fragments and redecorate the aquarium. Although this is generally nondestructive, occasionally the rubble may get dropped onto corals or clams and thereby irritate them, or possibly the "rubble" they choose to move will be your prized Acropora fragment. If this is the case, precautions will obviously need to be taken by either removing the smaller rubble pieces or super gluing the fragments into place. Another habit that may need the aquarist's close attention is their propensity to spit, which many members of the Balistidae family have. Although this can be entertaining, care should be taken to ensure all electrical sockets are waterproofed before adding these fish to the aquarium. Three of the five Xanthichthys species do show up for retail sale with some regularity. Xanthichthys auromarginatus is commonly called the Blue-chin Triggerfish because of the male's coloration, which includes a vibrant blue patch extending from its mouth back to nearly its gills. 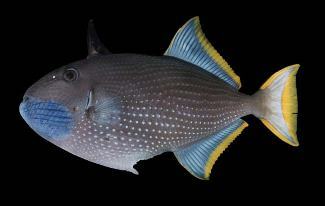 Females lack this patch and have been given the common name - Gilded Triggerfish. This species can be found in shallow water, occasionally less than 40 feet deep, but they are more common at depths in the 80 - 120 feet range. An adult Bluechin will not reach 10" long, making it one of the smaller triggerfishes and perhaps more suitable than some of its larger cousins for the home aquarium. Another highly attractive option is Xanthichthys mento, more commonly referred to in the marine aquarium trade as the Crosshatch Triggerfish, although some sources may still be calling it the Redtail Triggerfish. No doubt the latter common name was awarded based on this species' males' coloration. Individuals of nearly 1' in length are possible, so planning ahead for a large fish would be prudent. 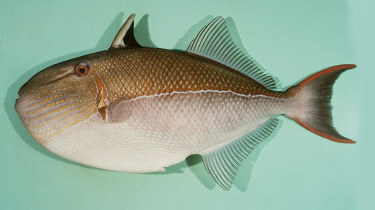 The Redtailed Triggerfish, Xanthichthys mento, has a distinct difference in the coloration of the tails, and this assists in distinguishing males from females. Note the color of the females tail in the bottom photo as compared to the red of the males (top). Photos courtesy of John Randall. The Sargassum Triggerfish, so-called because juveniles can be found floating adrift with clumps of Sargassum alga, is noted to change colors rapidly to match its surroundings. The normal color of Xanthichthys ringens is described as bright blue but gray, lavender and even yellow have been noted on the same fish. This is the largest of the regularly available Xanthichthys species, reaching lengths just shy of 14 inches. 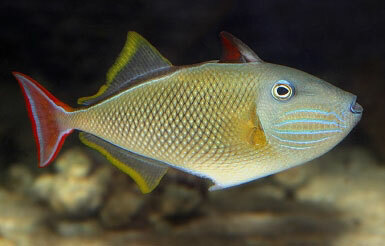 Triggerfish are not common in reef aquariums due to the family's overall destructive nature. However, their often-eclectic coloration and their interesting habits of redecorating rockwork and spitting water combine to make them more than your average aquarium fish. Only a few triggerfishes are welcome in reef aquariums and those species comprising the genus Xanthichthys are suited to this requirement quite nicely. 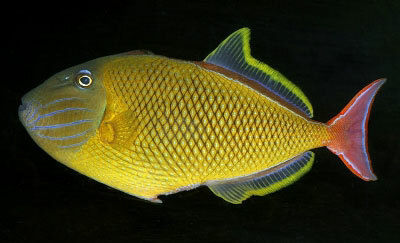 Xanthichthys ringens is consider one of the most common reef fishes in depths below 100 feet on most West Indian reefs. Conversely, they have also been found drifting in Sargassum on the surface 120 miles off the coast of San Salvador. Photo courtesy of John Randall. Berry, G.H. and Baldwin, W.J. 1966. Triggerfishes (Balistidae) of the eastern Pacific. Proc. Calif. Acad. Sci. Ser. 4, 34: 429-474. Burgess, W.E., et al. 1991. Dr. Burgess's Mini-Atlas of Marine Aquarium Fishes MiniEdition. T.F.H. Publications. Neptune City. pp. 581 - 584. Hobson, E.S. 1974. Feeding relationships of Teleostean fishes on the coral reefs of Kona, Hawaii. Fish. Bull. 72: 915-1031. Jordan, D.S. 1919. Xanthichthys mento from Santa Catalina. Copeia No. 65: 2-3. Klausewitz, W. 1974. Litoralfische der Maldiven. IV. Die Familie der Druckerfische, Balistidae (Pices: Tetraodontiformes: Balistoidei). Senckenberg. Biol. 55: 39-67. Lieske, E. and R. Myers, 1994. Collins Pocket Guide. Coral reef fishes. Indo-Pacific & Caribbean including the Red Sea. Harper Collins Publishers. 400 p.
Randall, J.E. 1968. Caribbean reef fishes. TFH Publications, Jersey City. 318 pp. Randall, J.E., Matsuura, K, Zama, A. 1978. 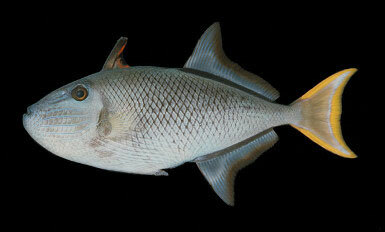 A Revision pf the Triggerfish Genus Xanthichthys, with Description of a New Species. Bull. Mar. Sci. 28(4): 688-706. Richardson, J. 1856. Ichthyology, Classification - Plectognaths. Encyclopedia Brittanica, London, Edition 8, 12: 312-314.